Unroll each puff pastry onto a clean cutting board. Cut each sheet into 3 long rectangles, and then cut each rectangle into 3 even squares, for a total of 9. For all 4 sheets you should have 36 squares. Line a few baking sheets with parchment paper and carefully place the rectangles down, leaving a 2-inch boarder around them. They will puff up as the bake. Using a paring knife score a 1/4-inch boarder around the squares and poke 13-15 holes in the middle, this will ensure the middle doesn’t puff up as much as the boarder. Egg wash the entire top, making sure you don’t drip down the sides. Place in the preheated oven and bake for 13-15 minutes or until puffed and golden brown. Remove and let cool. Once cool re-cut the boarder following the score marks you made before baking and push down to make a well. To make the filling combine the lemon curd and yogurt in a medium bowl and whisk together until smooth. Place the blueberries in a shallow nonstick pan and heat over medium until they turn bright blue and shiny but do not burst. You just want to warm them up slightly. Remove from heat. 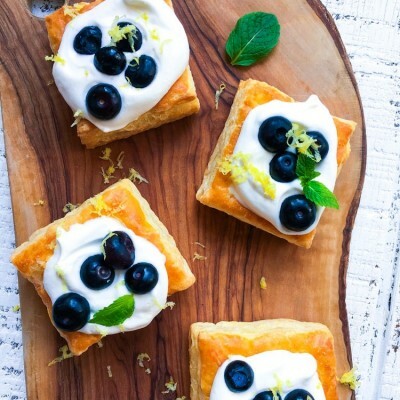 To assemble, fill each puff square with 1 to 1 1/2 tablespoons of the lemon yogurt mixture, followed by a scoop of whipped cream, a few warmed berries and finish with a sprinkling of lemon zest and a mint leaf.